Black metal band reformed as nu-metal powerhouse Mayhem released their latest album Esoteric Warfare on June 6, 2014. 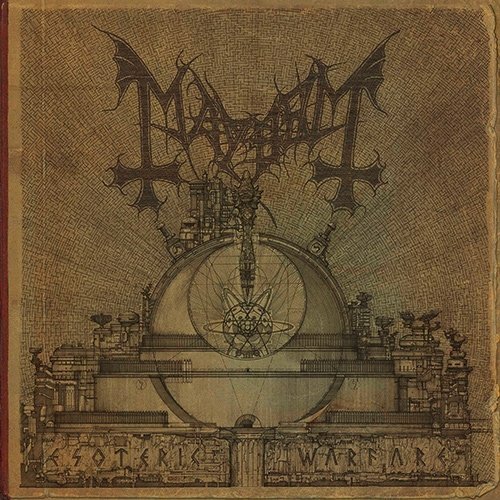 Much like late-career albums from Triptykon and Massacra, the latest Mayhem shows that as a metal band ages the probability of it becoming Pantera or Southern Fried rock approaches one. Although the album communicates little to no artistry or depth, it offers a strong example of how to successfully appeal to one’s commercial audience by being both digestible and using lots of hard and heavy sounds the audience recognizes as dangerous… if they came in any other form than a commercial product. Esoteric Warfare creates a blueprint for success by appropriating nu-metal’s populist simplification of the speed metal style of mono-dimensional lower-string muted riffing and sprinkling it with the pixie dust of commercial black metal aesthetics.. The band thus builds its appeal entirely from catchy central riffs which are so reduced in complexity that one is capable of comprehending them on first listen. The rest is garnish: the introductions, acoustic breaks, spoken word sections, black metal fireworks, seemingly random caesuras and even some death metal technique that randomly flares in the midst of the thudding rhythmic hook. This album belongs more to the exoteric, or easily and equally grasped at first contact, than the esoteric like older black metal, which deepened in revelation the more the listener devoted his or her consciousness to exploring it. With the latest generation, the rock-metal hybrid that industry has always wanted rears its ugly head here. The new innovation is this tendency to break up the monotony with garnish, which allows the monotonic lower register riffs to drone on with strategic breaks to remind the listener that the entirety of an album does not necessarily need to sound indistinguishable however much the band may be seemingly trying to lead it in that direction. Complete sonic pointlessness does not dissolve, but rather mutates into a more friendly and funky exterior, thus allowing the listener an escape from a complete degradation of metal as an art form into a complete degradation of jazz as an art form. Whether that constitutes progress will be left to the view of the reader.